In celebration of Women’s History Month, Cooper Hewitt is dedicating select Object of the Day entries to the work of women designers in our collection. Greiman’s work expresses an undeterred individualistic spirit, typical of the Postmodern movement, but also alludes to the graphic designer’s interdisciplinary experimental practice—one that spawned an entirely new computer-generated visual vocabulary in American design. This aesthetic is perhaps best exemplified in her 1993 AIGA Communication Graphics poster, held within Cooper Hewitt’s collection. Trained during the 1960’s at the Kansas City Art Institute and later at the Allegmine Gewerbeschule, working under legendary graphic designers Armin Hoffmann and Wolfgang Weingart, Greiman, developed a strong modernist approach to her work. Though she practiced and taught in New York during the early 1970s, it wasn’t until she moved to Los Angeles and bought her first Macintosh computer in 1984 that she really started to define her style. Weingart described Greiman’s post-grad work as “ideas developed at Basel [taken] in a new direction… [with the use] of color and photography.” Her digitally rendered works were characterized by overlapping forms, diagonal perspective lines, and gestural strokes. Greiman threw all conventions out the window while creating a new visual language that unashamedly paid homage to computer generated design, bridging the divide between modernist and postmodernist design practice. She achieved this through the collage of pixelated type, video stills, and graphic symbolism. Working with early drafting programs like MacWrite, MacDraw, FullPaint, and PageMaker, she spent much of the 1980s developing a range of projects, including packaging, corporate identities, and television commercials. This new approach is evident in Greiman’s 1993 AIGA Communication Graphics poster design. Reflective of her own work and of broader industry trends at the time, this poster equates digital and virtual innovations with physical and spiritual human energy. Colored brains representing the seven chakras—energy points throughout the body—are positioned atop a human figure, in a visualization of consciousness beyond physical evolution. 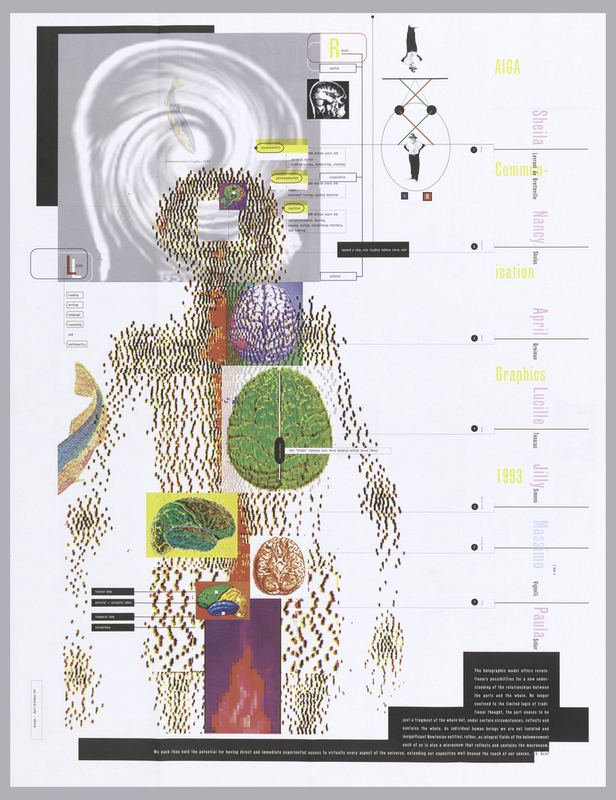 Greiman’s poster demonstrates her evolving conceptual process in graphic designs, as well as photography and installation projects. Adrian Madlener is an MA Fellow in the Drawings, Prints & Graphic Design Department at Cooper Hewitt, Smithsonian Design Museum. He is enrolled in the History of Design and Curatorial Studies program at Parsons / Cooper Hewitt. April Greiman, quoted in Charlotte Fiell, Peter Fiell, and Annette Wiethüchter, Graphic Design for the 21st Century: 100 of the World’s Best Graphic Designers (Cologne: Taschen, 2003), 244. Byrne, Chuck. “A Cold Eye.” Print, September/October 1987, 120-44. “School of Visual Arts Honors April Greiman with the Master Series Award and Exhibition.” Artdaily. October 24, 2008. Accessed March 7, 2016. Http://www.artdaily.com/index.asp?int_sec=11&int_new=26821&int_modo=1. Nielson, Erfert. “April Greiman: Riding a New Wave.” Mkgraphic. March 27, 1997. Accessed March 7, 2016. Http://mkgraphic.com/greiman.html. Polledri, Paolo. “April Greiman: Pioneer of Aesthetic Passion.” Graphis 52, no. 309 (November/December 1996): 38-45. Rombough, Howard. “April in Alpha.” Creative Review 14, no. 5 (May 1992): 45-46.